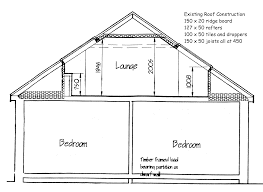 Building plans are the set of drawings which consists of floor plan, site plan, cross sections, elevations, electrical, plumbing and landscape drawings for the ease of construction at site. Drawings are the medium of passing the views and concepts of an architect or designer into reality. Site plan is comprehensive detailed drawing of the building or an apartment representing whole plan of a building. It shows property boundaries and means of access to the site, and nearby structures if they are relevant to the design. For a construction project, the site plan also needs to show all the services connections like drainage and sewer lines, water supply, electrical and communications cables, exterior lighting etc. Fig 1: Site Plan of a house. Its a first design that is made for any project before going into detailing process. Drawing up a site plan is a tool for deciding both the site layout and the size and orientation of proposed new buildings. These drawings should comply with the local development codes, including restrictions on historical sites. It acts as a legal agreement for the permission of construction from the government body. For this, it is required that the site plan is made by a licensed professional like architect, engineer, landscape architect or land surveyor. A plan means, top view of any building or object. Floor plan is the most fundamental architectural diagram, a view from above showing the arrangement of spaces in building in the same way as a map, but showing the arrangement at a particular level of a building. Floor plan view is defined as a vertical orthographic projection of an object on to a horizontal plane cutting through the building. This shows the walls, windows, door and other features such as stairs, fittings and even furniture too. Fig 2: 2D Floor Plan. 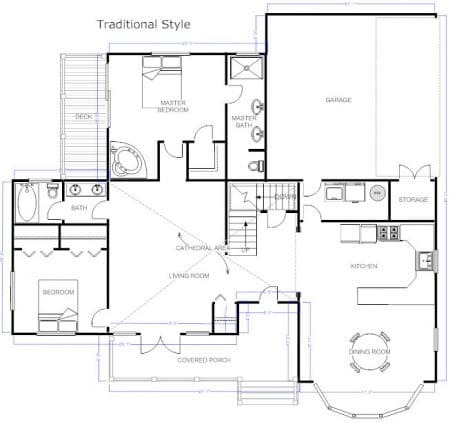 Floor plan is usually given in 2D form, which has all the measurements and detailing. 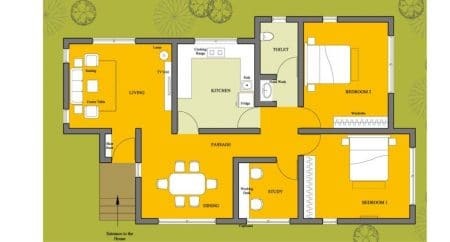 Now a days for a better understanding and conceptualise the plan prior to the construction, floor plans are made in 3D where one can see how the entire apartment looks with furniture from above, giving you a way to see not only how objects fit in the space, but how specific furniture pieces look together. 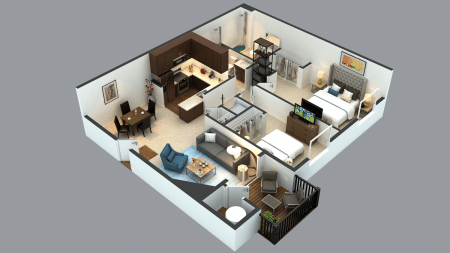 Fig 3: 3D Floor Plan. Geometrically, a cross section is a horizontal orthographic projection of a building on to a vertical plane cutting through the building. Cross section is vertical cut section of any building which shows the details of dimension, thickness of any component of a building. It also represents the sill height, lintel height, floor height and other minute details of a structure. The section plane where the plan is vertically cut is represented in the 2d floor plan by a bold dotted straight line. Exterior elevation is the outside representation of a building. It consists of details of type of finish, floor height and projections if any. 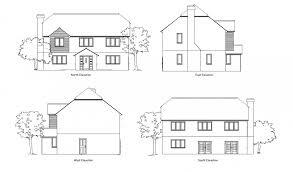 Exterior elevations can be 2D or 3D drawings. 2D drawings typically have measurements on them, showing where the relationship between exterior elements like doors and lights. 2D elevations also can have callouts to different kinds of bricks, stones, and paints, so you know exactly where each material needs to go. Fig 5: 2D External Elevation. 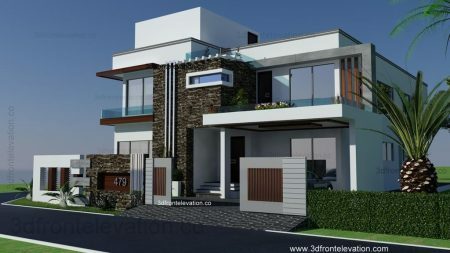 3D exterior renderings are similar to their 2D counterparts, except they focus entirely on the visual. Most of the time, a rendering is a concept drawing to take to whoever is constructing your project to give them an idea of what you want the exterior to look like. From the concept, they’ll create the detailed exterior elevation they need to build from. Fig 6: 3D External Elevation. Interior elevations are very similar to exterior elevations in purpose. Elevations are extremely useful when constructing a room such as a kitchen or bathroom, which require visualisation of built in elements. Fig 7: 3D Internal Elevation. 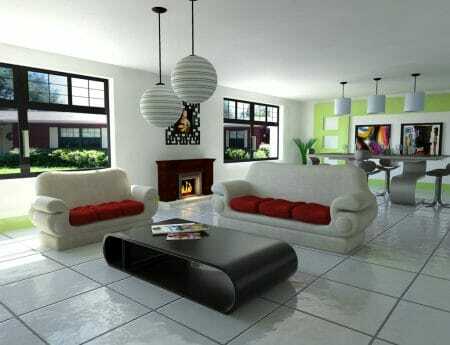 Usually interior elevations are made in 3D that show your furniture in your space. The inner elevation effects a lot on the living condition and peaceful mind. These days great importance is given to interior elevation than exterior elevation. Interior elevation has the paint colour, lightning types, furniture design and floor patterns. A perfect home or a building has a lush green garden adjacent to it, which enhances the beauty or aesthetics appearance of the building. Hiring a landscape architect for the beautification of houses is trending now a days. 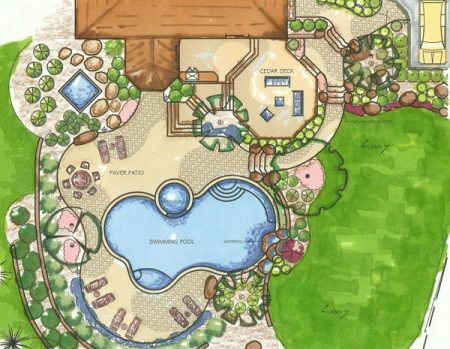 On landscape plans, you’ll see everything from flowers to sidewalks and lawn decorations to fountains. It majorly consists of sidewalks, plantations and other decorative features that can enhance the living area.